Victoriaville, January 15, 2019 – The Governments of Québec and Canada are granting $9,086,460 in financial assistance to Victoriaville & Co. Inc., Groupe A.B.L. inc., Métallomax inc., Vic Store Fixtures Inc. and G.G. Telecom. These contributions will help these Victoriaville and Warwick businesses to grow their markets and increase their productivity, notably by acquiring new technological equipment and improving their facilities. The total investment generated by these projects is estimated at nearly $14 million. The Honourable François-Philippe Champagne, Member of Parliament for Saint-Maurice—Champlain and Minister of Infrastructure and Communities, on behalf of the Honourable Navdeep Bains, Minister of Innovation, Science and Economic Development and Minister responsible for Canada Economic Development for Quebec Regions (CED), and National Assembly of Québec Member for Arthabaska and Chief Government Whip, Eric Lefebvre, on behalf of Pierre Fitzgibbon, Minister of Economy and Innovation and Minister Responsible for the Lanaudière Region, made the announcement today. 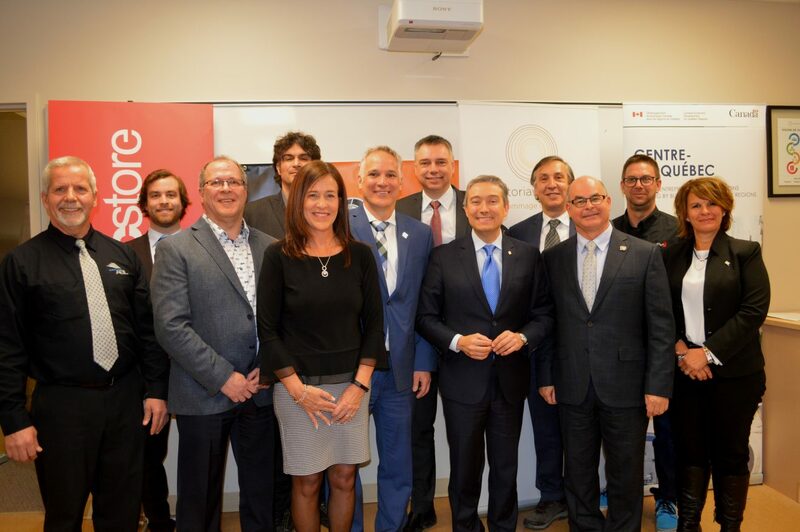 The Government of Québec and Investissement Québec (IQ) are granting nearly $7.5 million in financial aid to these manufacturing businesses to support their plans for growth, specialized equipment procurement or product development. This financial support includes loans totalling $3,745,500 from the Ministère de l’Économie et de l’Innovation’s ESSOR program, in addition to loans totalling $3,745,500 granted from IQ’s own funds. The Government of Canada is providing a total of $1,595,460 in financial assistance. The funding was awarded under CED’s Quebec Economic Development Program in the form of repayable contributions. These projects will create about 10 jobs in the Centre-du-Québec region. Alain Dumont, President, Victoriaville & Co. Inc.
Alain Laroche, President, Groupe A.B.L. inc.
Pascal Picard, Owner and CEO, Métallomax inc.
Fabrice Canin, President, Vic Store Fixtures Inc.